So, puzzle/action game Nimbus was released on Steam (for ten bucks) yesterday. It’s pretty damn fun. You pilot a spaceshipy thing with no internal propulsion system glider shaped like a spaceship, meaning you have to rely on the environment and gravity to move. The barebones plot has you struggling to rescue your ship-mate– Err, mate who is a flying ship. It’s pretty simple gameplay wise, controlled entirely with the arrow keys. It’s also billed as a racing game but getting a good time is entirely optional and it definitely seems more puzzley. 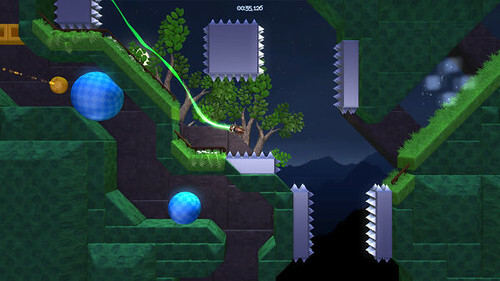 While it starts simple– straight-forward navigating to the exit –more elements are added to the levels and it becomes harder and harder to retain precious momentum or avoid spikes and lasers, growing quite challenging. There’s also tons of unlockables, in the form of trails and different ships, and unlocking them requires secret items (giant coins and hidden levels! ), which range in placement from the simple 10-feet out-of-reach to brain-rackingly difficult to get to. The game is very polished, and it’s difficult to fault it for anything; the failures are fair and the challenges are well, just part of the challenges. On a different note: there’s strangely almost no information on the developer’s, Noumenon Games, website, but… eh, too bad. It’s fun. There’s no demo, sadly, but it’s easily worth the $10 if you’re willing to make the leap-of-faith. Ah, Kvalsternacka(SP? )… I remember when he was but a fledgling dev using Game Maker… He had a very impressive 2D platform demo. I was the one who nominated him into The Poppenkast back in the day (ahem, finder's fee?? ;)) This game looks nothing short of beautiful, though! Sounds like you know more than I know, Paul. FUN FACT: Did you know his name means something weird in a European language? It's like… Flea-sucker or something. It's a portmanteau of two words of that language. I forget, though. I really want an editor for this. And there does seem to be an “editor” data directory in the install, but no way to start it..
Are you sure? I thought I did :/ Weren't you the one to nominate me? We've disabled the editor in the release. It requires an connection to our level server at this point, and it isn't very friendly for those who aren't accustomed to it, beside it looks like crap hehe. We'll see if we can't tidy it up a bit and release it in the future however. Felix (one of the developers) is a great guy, I'm sure they deserve whatever beer money pours in! I'll purchase this asap and also a spare keyboard because I'm THAT kind of puzzle game player. also this 'new' (new to me) reply system is great! I checked the video on the devs website.. beautiful! Really nice 2D/3D effect. Awesome guys, I am glad your game has made it out to the real world. Hope it will make you filthy rich. This clearly shows that Kvalsternackas Game Maker days paid off. If I don't remeber wrong, this game is based on a smaller game prototype he showed off in school one day. To be honest he has made a few prototypes and games in there that are really interesting. I can't wait to see what their next project is. I do remember that little paperplane game, which i belive is the 'origin' of this game. Will purchase this asap. Kvalsternacka is a portmanteau of “kvalster” and “palsternacka”, which mean “mite” and “parsnip” in English, respectively. Me and Flink have been considering adopting you, but we haven't been able to get official papers on it yet. First and foremost we're aiming on survival, just as most small independent studios we have a heck of a lot of ideas we want to realize! As programming resources is at a premium, shaping up the editor sadly isn't prioritized for now. Check out our blog at blog.noumenongames.com for more information!